Kohnstamm were manufacturing chemists. This building at 537 Columbia St. between Bay St. and Creamer St. in the Red Hook section of Brooklyn was the factory. Corporate headquarters are referred to on the right as 161 Avenue of the Americas (6th Ave.), Manhattan. 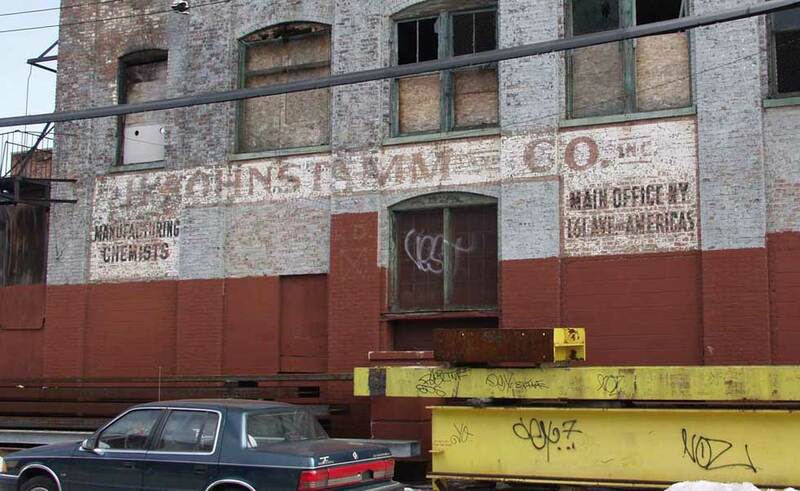 The New York telephone directory indicates that Kohnstamm had a plant here as early as 1912 and stayed until the early 1980s. Offices were located at 161 6th Ave., Manhattan, from approx. 1961 to 1976. The business began on Tryon Row downtown approximately where the Municipal Building was built in 1914. The website www.colorantshistory.org/HKohnstamm.html gives extensive information on the Kohnstamm products that included color for paints and food dye as well as laundry products. It also shows a photo of Kohnstamm & Co. on Tryon Row, 1853-1861. The site credits two cousins, Hesslein and Heiman Kohnstamm, with founding the company. Yet the sign on the Tryon Row Buildings reads, "Jos. Kohnstamm, Importer of Paints & Colors." Also, the Trow & Rode city directories for New York 1852 through 1866 list Joseph Kohnstamm as the original Kohnstamm in business on Tryon Row as a "manufacturer of ultra-marine and importer of artists colors" (Trow, 1852-53). In 1865 Joseph Kohnstamm applied for a passport where he declared, "Joseph Kohnstamm residing at 104 East 14th Street in the city of New York, dealer in Paints says that he is a naturalized citizen of the United States of America, that he is 53 years of age, that he was born in Bavaria in the Kingdom of Bavaria on or about the 8th day of July 1811 and arrived in the city and county of New York in October 1851 where he has resided ever since & still continues to reside." Heiman Kohnstamm first appears in the city directories (as Herman Kohnstamm) in 1867, Hesslein Kohnstamm in 1871. The business name, H. Kohnstamm, possibly dates no earlier than this time. Yet, Heiman Kohnstamm was already living in the U. S. by 1855. In Nov., 1855, the following notice appeared in the New York Times: "Married, In this City, on Wednesday, Oct 17, by Rev. J. J. Lyons, at his residence, Mr Heiman Kohnstamm, of this City, to Miss Gida, youngest daughter of Mr. Joseph Kohnstamm, of Neustadt on the Saal, Bavaria. Germany." Heiman Kohnstamm appears in the U. S. Census of 1860 living in Jersey City, N.J. with his wife, Gita, and his sons, Leo, Edward, and Joseph (ages 4, 3, and 3 months). By the time of the 1870 Census Heiman Kohnstamm lived in Brooklyn, and his family now consisted of Gita, sons Leo, Edward, Joseph and Arthur, as well as two cousins, Emanuel and Emil Kohnstamm. In 1880 Heiman Kohnstamm still lived in Brooklyn (493 Bedford Ave.) with much the same family, except that Emanuel Kohnstamm now had his own residence with his wife, Emily Lambert, whom he married in Detroit, Michigan, 7 April 1880. This advertisement for H. Kohnstamm at 100 Chambers St. dates from 1871-72. A much later advertisement (1920) referred to Kohnstamm's office address: 87-89 Park Place. It was primarily Emanuel H. Kohnstamm (1851-1910) and Emil Victor Kohnstamm (1853-1922) who carried on the business into the 1890s. Also important was Edward G. Kohnstamm (1857-1939), Heiman's second son, who is referred to in the colorantshistory.org website as E. G. Kohnstamm.